*Please note that the 250K STY Assay and the 10K Assay are now offered as a made-to-order supply from Affymetrix. Affymetrix states on their website to allow additional time to process these orders. In addition, you must order at least 30 arrays when ordering the 10K array. Investigators may choose to have the facility extract and prepare DNA for them directly from frozen tissue, cell culture, or FFPET samples. Alternatively, researchers can choose to submit investigator-prepared DNA samples. High quality DNA is critical to the success of a microarray SNP assay. All samples generated within the CGF and investigator-prepared samples will be assessed for quality via the Nanodrop spectrophotometer, and the Agilent Bioanalyzer and Qubit fluorometer in the case of FFPET samples. Investigators will be notified of all samples that do not meet Quality Control criteria for quantity and quality. Please see Sample Requirements below for more information. ^These are the minimal amounts specified in the respective protocols. 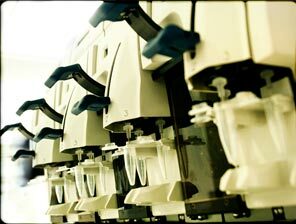 We recommend you provide us with excess in order to run QC analysis and to repeat assays if necessary. Fresh tissue samples should be flash frozen in 2.0 mL or Nunc tubes in LN2 or dry-ice and maintained at -80°C until submitted to the CGF. Cells should be pelleted in 1.5-2.0 mL tubes, all supernatant removed, and then flash frozen in LN2 and maintained at -80°C until submitted to the CGF. Submit (10) 10 micron blank slides for FFPET extraction. The CGF can perform macro-dissection of the FFPET slides. The researcher must provide an accompanying H&E slide with the area of interest outlined. If this service is requested, we suggest that the researcher talk with a CGF staff member prior to submitting samples to go over the protocol for identifying the area of interest. Once samples have been extracted, they will be assessed for quality, quantity, and concentration prior to beginning microarray assays. If purified DNA is submitted, it will be quantified via UV absorbance using a Nanodrop spectrophotometer and also by a Qubit Fluorometer; for FFPET samples, degradation will be assessed using the Agilent Bioanalyzer. All DNA samples must have an A260:A280 ratio of ≥1.8. Investigators will be notified if a sample is of insufficient quantity or quality (failed Quality Control parameters) for optimal array performance. Samples cannot be processed until a completed Service Request Form is received along with a signed estimate. The new Affymetrix Genome-Wide Human SNP Array 6.0 features 1.8 million genetic markers, including more than 906,600 single nucleotide polymorphisms (SNPs) and more than 946,000 probes for the detection of copy number variation. 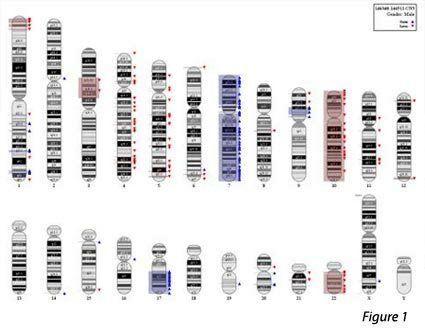 The SNP Array 6.0 is the only platform with analysis tools to truly bridge copy number and association, including a new, high-resolution reference map and a copy number polymorphism (CNP) calling algorithm developed by the Broad Institute. The SNP Array 6.0 demonstrates industry-leading performance and represents more genetic variation on a single array than any other product, providing maximum panel power and the highest physical coverage of the genome. The GeneChip® Human Mapping 500K Array Set provides consistently high coverage across different populations. It is comprised of two arrays, each capable of genotyping on average 250,000 SNPs (approximately 262,000 for Nsp arrays and 238,000 for Sty arrays). The Mapping 500K Array Set uses the same proven assay as the GeneChip® Mapping 10K Array and Mapping 100K Set that has been validated in over 120 published studies in less than three years. 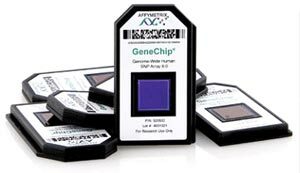 The GeneChip® Scanner 3000 7G is an extension of the GeneChip® Scanner 3000 (GCS 3000) series that allows you to scan next-generation higher-density arrays, including SNP arrays with up to 900,000 SNPs, tiling arrays for transcription and all-exon arrays for whole-genome analysis. The GCS 3000 7G combines space-saving and other design improvements with speed, superior performance and lower scanner-to-scanner variation to dramatically improve throughput and efficiency in your genetic analysis. The GCS 3000 7G also provides enhanced auto-focus and more consistent scanner-to-scanner biological performance to improve data integrity and data sharing between researchers. In addition the GCS 3000 7G has been designed to accommodate future advancements in GeneChip® probe array technology. 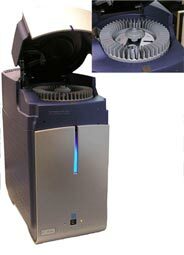 Combined with the GeneChip® AutoLoader, the GCS 3000 7G provides sample tracking, temperature control and walk-away freedom from scanning.